When it comes to fashion, men prefer to shop knowing exactly what they're looking for, while women like to stumble upon new finds. And that's the great thing about shopping online – you can happen upon cool new boutiques, fashion designers and handbag designers. 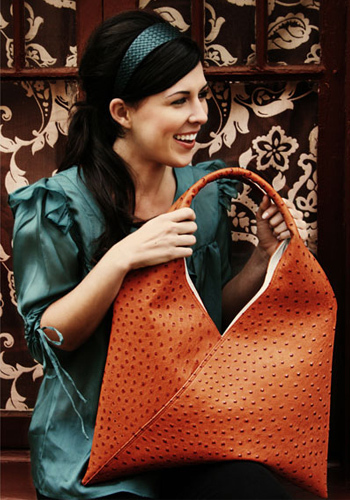 Through the web, I came across the dreamiest summer-loving handbag, the Cognac Shopper ($275) from Al Amirah. It's a simple bag that's simply amazing! The Shopper is an oversized, rust-colored ostrich skin bag, and the color pops, though the tone is not so bright that it doesn't coordinate with everything. The shape is different, with a cool V-shaped top and single rolled handle that let you carry it comfortably while still keeping your things safely inside. You can even select your own interior lining for the bag! This Shopper is on my 'It' list for Spring, and Al Amirah is definitely a line that I'll be stumbling upon again!